Enjoy American-handcrafted body care products, candles and personal fragrances with our Barr-Co. collections at Distinctive Decor. Even this American company's distinctive gift boxes are made in the U.S. Find lotions and soaps scented with milk, oatmeal, vanilla and vetiver. We have fresh scents in Barr-Co. fragrances like Fir & Grapefruit, a combination of grapefruit zest combined with woodsy fir oils. All Barr-Co. products are made without sulfates or petrochemicals. More than 98 percent of each lotion or soap is created with natural plant extracts and soothing botanics. To ensure quality, all products are made in small batches. The Barr-Co. Soap Shop collection includes six varieties of natural vegetable soaps. These Barr-Co. soaps add a combination of olive oil and shea butter for soft-feeling skin. 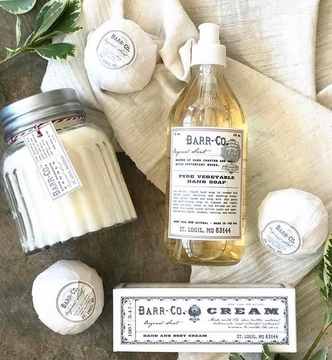 We have solid perfumes, lip balms, lotions, soaps, clay scrubs and home fragrance sprays by Barr-Co. Our Barr-Co. soap and lotion caddy is a delightful gift for housewarmings, best friends and holidays. We have gift soap sets by Barr-Co., too. Feel wonderful on the road with our Barr-Co. travel gift sets filled with soap, cleanser and lotion favorites. We have candles in apothecary jars and bath soak salts in milk jars. Our Barr-Co. soap dishes are beautiful buys for the bath or vanity. We have Barr-Co. Apothecary reed diffuser fragrance sets and gift-boxed Barr-Co. Apothecary Eau de Parfum cologne spray. Consider beautifully bottled bath elixirs and liquid hand soaps. Our Oklahoma-based company is proud to be an authorized dealer for this American heartland-based creator of such delightful creams, lotions, soaps and candles. Enjoy fast, low-cost shipping with your order.